f you're blessed with naturally curly hair you'll know that styling those tresses can be a little more tricky for you than for those of us with straight hair. Here at Milk + Blush we're all about celebrating your individuality and when it comes to your hair we want you to express yourself! 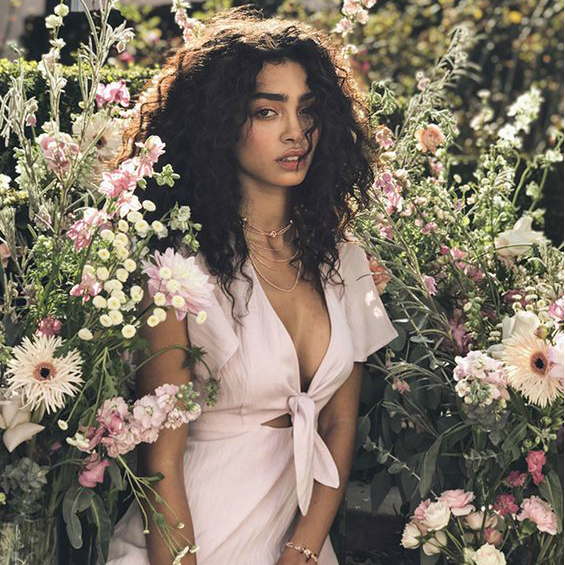 Stylists have used M+B Hair Extensions to style celebs such as Winnie Harlow and Solange Knowles and made them work for their amazing natural hair texture. So, along with help from our resident Milk + Blush curl queen, Keshia, today we're sharing with you some of our tips and tricks for styling hair extensions for naturally curly hair. You may find that you have more than one tone running through those curly locks which can make blending extensions that bit more difficult. While you can opt from our range of highlighter shades, you can also get a really natural, multi-tonal effect by using a combination of two or more Milk + Blush shades. Our curly haired Milk + Blush Babe Keshia wears a combination of the shades. Love This Feeling' and Sweet Like Chocolate' as her hair is quite dark but has slightly lighter, sun-kissed tones running through it and this creates a supernatural, blended look for her. You can go for two sets in two different shades or simply opt to add in a few Single Wefts or a Quad Weft in a different shade to your full set for some extra tones. Finding your ideal shade of Milk + Blush Hair Extensions is so simple, click here to find out more. As a curl connoisseur, you'll know that no one curl is the same so it can be tricky to style your hair extensions to match. The best way to blend your extensions is to look at the formation of your natural curls. Are they uniform? Corkscrew like? Going in different directions? You can mimic your naturals curls with your Milk + Blush hair extensions in so many ways - try using a chopstick curler, braiding your wefts and leaving them overnight or using a 1-inch wand and curling the hair alternate ways. To style Keshia's hair, we curled the wefts separately using a chopstick curler and curled the hair in alternate directions before clipping them in. A great tip for curling your M+B hair is to clip the wefts in a hanger or place the top of the weft inside a strong drawer and close it leaving the hair free to curl, this way you get ultimate control when styling. The beauty of natural curls is that they're often messy and wild looking - no uniformity here thank you! So you want to recreate that same texture in your Milk + Blush hair extensions otherwise things can look a little odd! If your hair is super big try gently backcombing your styled wefts and breaking up the curls. If your curls are more structured use a serum or hairspray to help keep their shape. Once the curled wefts were clipped into hair vendors we used a little smoothing balm on our fingertips to break the curls up and incorporate them into her own hair. The balm allowed us to break up the curls and make them big and textured without going frizzy - super easy. Hair extensions are amazing but sometimes are difficult stylishing them. Great tips!